One night only “Concert in Marin”. 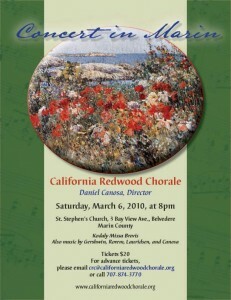 The California Redwood Chorale was joined by the Camerata California of Sacramento in a candle-lit performance of Kodaly’s “Missa Brevis” in St. Stephen’s Church in Belvedere, California. It was the perfect venue for this music. Additional repertoire for the concert was American music. A very special concert!